I am finding that the phrase "necessity is the mother of invention" is holding true throughout the ages. Little by little I am learning to take advantage of the incredible information here on Active Rain. I have toyed with the idea of adding widgets to my sidebar for some time. I stormed over to my profile's edit bar and clicked. I knew nothing. I gave it a try with our company logo and well, I actually got the logo in there but what a mess it looked like! Yuk. I was continually annoyed at the mess on my sidebar till I found a reason to care about the sidebar today! I had a slight interest in widgets, like knowing who's looking at my posts or maybe waving at them when they were there but I never felt like it was "NECESSARY" until today. Today, I found the reason to go the extra mile to learn "HOW TO". I went to our faithful "SEARCH" and typed in "add widgets to sidebar" and just as I suspected...up came every helpful "HOW TO" post ever written on this subject from many of our AR Stars. Thank you for all the helpful posts. . I read two of the posts and proceeded to my Profile to Edit like a Pro! I removed the awful logo with messy code and added what I felt really belonged there. I am hoping each and every person on this site will add this to their profiles. It's simple and easy and could save our children's lives. Please everyone...Add the Amber Alert! OR: Simply click here to learn more of how we can all help protect our children! Yes, they do ask for a donation but it is minimal. It's not required so load this in hopes of a great future! This, my friends, is a widget worth loading! Thank you for your support. We must protect our children. Bless you! ActiveRain FRIENDSHIPS ARE BLOOMING LIKE WILDFLOWERS! So Iconic It's Almost Ironic! 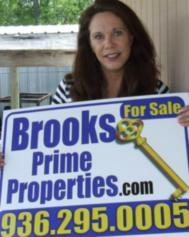 Brooks Prime Properties is looking for You!